(2011/ZYX) NTSC, Code 0, 129 Min. English, 11 tracks (Audio), b&w concert plus documentary footage. The word 'underrated' gets bandied about in music journalism almost as much as something being the work of 'genius.' Quite frequently neither tag is correctly applied to the art at hand. Still, with everyone vying for attention (or sympathy), hyperbole wins out every time. 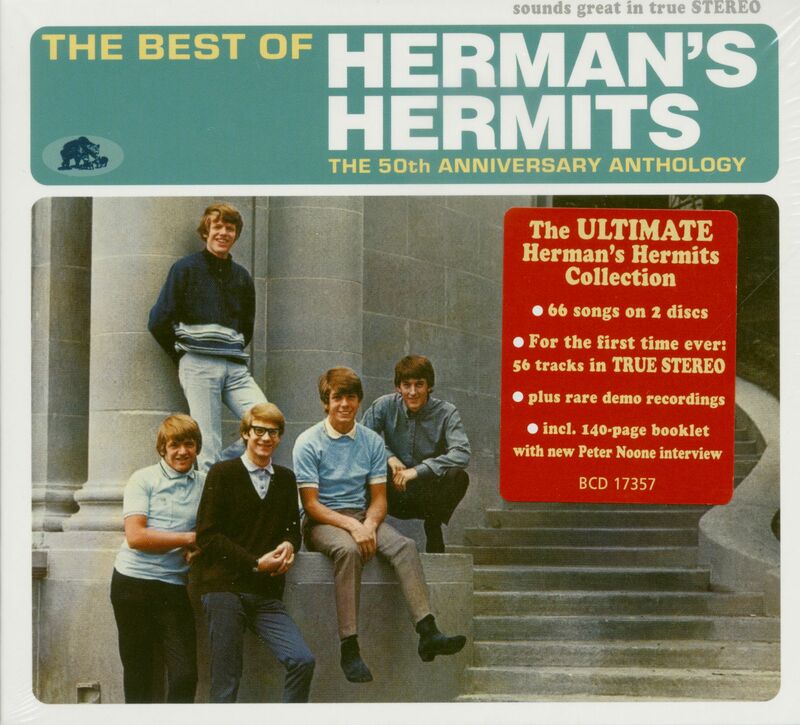 So, it is with heavy heart and cap in hand that I share with you a little history on a band called Herman’s Hermits, who I think may be the most underrated pop combo of the 1960’s. While many of their similarly chartbusting and culturally uncool contemporaries have received a retroactive critical reappraisal, this Manchester mob have never truly “had their day.” This collection is perhaps the most comprehensive study of the band recorded work and is but a glimpse at the sheer volume of great tracks they made during six very hectic years. It is undoubtedly a testament to their unique chemistry with producer Mickie Most that they created so many great and refreshingly unpretentious discs. In 1963, The Heartbeats were one of several dozen gigging beat bands working the clubs and dance halls of Northern England. With the addition of vocalist Peter Noone, this combo became professionally known as Pete Novak and The Heartbeats. The charismatic Noone was fresh from his appearances in the British soap opera, Coronation Street (in 1961 and 1962), and at the ripe old age of fifteen, was something of a show business veteran. Adopting managers Harvey Lisberg and Charlie Silverman, the group changed their collective name to Herman And The Hermits (Herman being short for Sherman of Bullwinkle fame). Trivia aside, Lisberg and Silverman were not only managers, but also a songwriting team with aspirations to make records. In the band they found a talented commodity to hawk their songs to an unsuspecting public. And that’s where Lisberg & Silverman entered as if on cue, with work at the ready. “These managers came along and decided that what would really move us to the next thing was to make a record. We were aspiring to a band who played live really well. That’s all. Records were something that would come probably one day, like Nat King Cole. “They said, ‘We’ve written this song.’ And we listened to them and said, ‘We can probably do that.’ There were other people before us where the managers wrote all the stuff.” In March 1964, Herman And The Hermits (as they were still known) traveled to London to record with producer, Ron Richards. Perhaps it was his work with another Manchester group, The Hollies, that had led them to his door, but the results (heard here for the very first time on “Only Last Night” written by their managers and another by a friend of the group’s, “Thinkin’ Of You”) also led them out the same one they came in through. On the advice of a second producer, Mickie Most (during a rumored demo session for Lisberg & Silverman’s “Your Hand In Mine”), the managers were told to replace the Herman's Hermits’ rhythm section if they wanted the band to make it. Such was Most’s to-the-point advice that only weeks later, Hermits’ Alan Wrigley and Steve Titterington were history. On April 1, 1964, drummer Barry Whitwam and guitarist Derek “Lek” Leckenby joined and solidified the unit with Karl Green moving to bass and Keith Hopwood holding down the rhythm guitar post. Lek reportedly inspired the group’s next creative coups: Herman And The Hermits he thought sounded too “old fashioned,” and so they became simply Herman’s Hermits. Despite swift action and the frenetic pace of the music scene in general, it wouldn’t be until July 1964 that Mickie Most would bother to see the Hermits again. He was busy in the studio with The Animals; their second 45, “House Of The Rising Sun,” would go on release in June. The same month, Most issued The Nashville Teens’ take on “Tobacco Road” and suddenly he was the biggest independent record producer in Britain. Not only did he produce the records, he licensed the recordings to the major labels and promoted them through his own company. Most importantly, he had an actual production credit on each disc, something of a rarity at that time in England. A plane ticket and managerial pestering finally brought Most back in touch with band. Catching the band at the Beachcomber Club in Bolton, he laid the song on them that provide their big break. Originally a U.S. hit for Earl-Jean on the Colpix label, “I’m Into Something Good,” was written, produced & arranged by the husband and wife team, Gerry Goffin & Carole King. Mickie had picked the song as a hit; now it was up to the Hermits to make it one. “Mickie liked to tell the story that he saw [my] picture and [thought] Peter Noone looked like Bobby Kennedy. And he wanted to sign the band based on this picture. He was then the Svengali-esque producer that said, ‘Try this, try this, try this.’ And for me, it was a magical thing, because Mickie Most and I spoke the same musical language. I would go to his house, and his wife would sit down with a guitar and they’d sing ‘Devoted to You’ by the Everly Brothers. 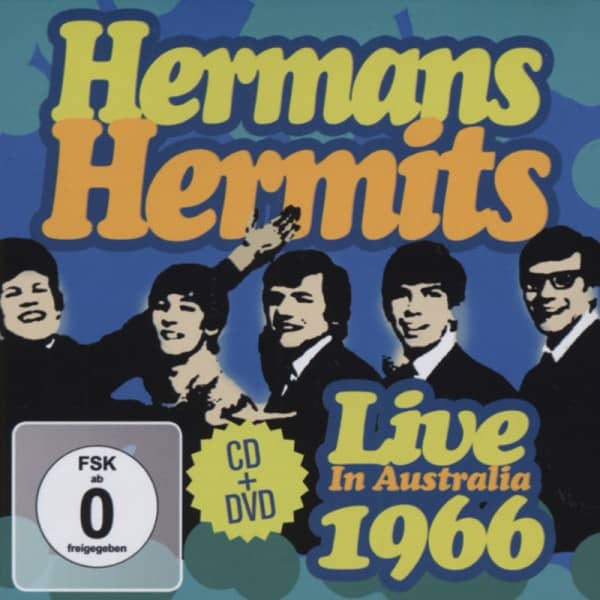 Kundenbewertungen für "Live In Australia 1966 (CD&DVD)"